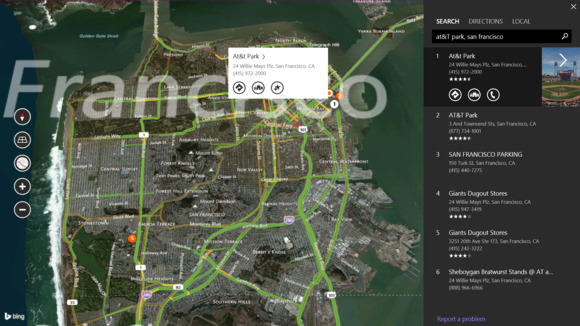 Microsoft debuted a true analogue to Google Earth on Thursday, launching a Bing Maps Preview app for Windows 8.1 that moves Maps into true 3D. The new app, available in the Windows Store, even launches by zooming in on a 3D globe—the signature opening shot of Google Earth. From there, Microsoft maps fans can swoop down to street-level scenery, plot routes from one point to the next, or simply fly about the virtual Earth, with 3D terrain like mountains appearing as it normally would. Several world cities are also mapped in 3D, to splendid effect. Several years ago, this would probably have put Microsoft on par with Google, prompting dozens of stories about how the two tech rivals were engaged in a heated race to virtually map the earth. Today, however, the new Maps, while visually impressive, probably is less of a utility then a curiosity. 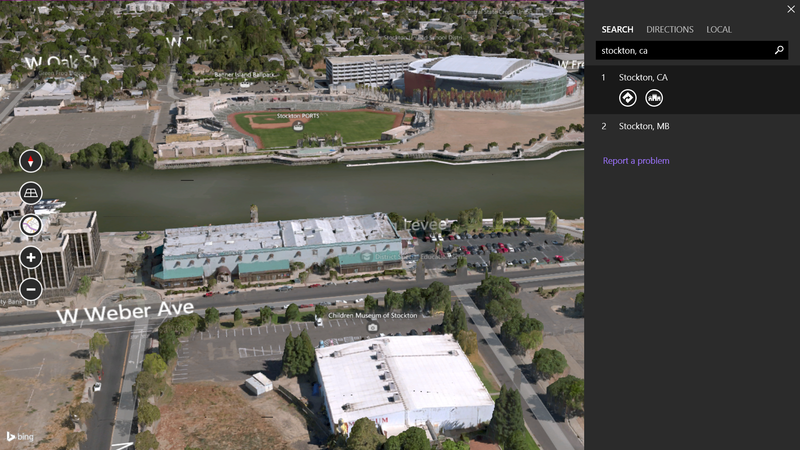 The new 3D maps view brings out the best of Stockton, Calif. In fact, you should probably think of the new Maps app as a complement to something like the new Foursquare app for Windows 8.1: a preparatory guide to a local area, rather than a tool to haul around while actually out and about. As you might expect, you can search for specific locations, map routes between two points, and use the Microsoft “local scout” to look for nearby points of interest. Finally, Microsoft has integrated Maps with Skype, so there’s click-to-call functionality added, too. Tapping the search bar allows you to search out a destination or map a route; you can also pull up a list of cities that Microsoft has mapped in 3D. Previous Maps versions used an offset, “bird’s eye view”; the new 3D-mapped cities are mapped instead in true 3D, and can be zoomed in and out and rotated. Most buildings look sharp, although zoomed-in trees and shrubs have a “melted” effect. Most of the 3D imagery looks good, but don’t expect it to look perfect. In general, the 3D cities look fantastic; unfortunately, Microsoft’s choice in cities will leave you scratching your head. Several European cities (Valencia, Spain; Strasbourg, France; and Florence, Italy, to name a few) have received the 3D treatment, but virtually no major capitals have. In the United States, Microsoft gave the 3D treatment to cities like Des Moines, Champaign, Bismarck—even, inexplicably, Fresno, Calif. There are no New Yorks, Bostons, or Washington DC’s yet. 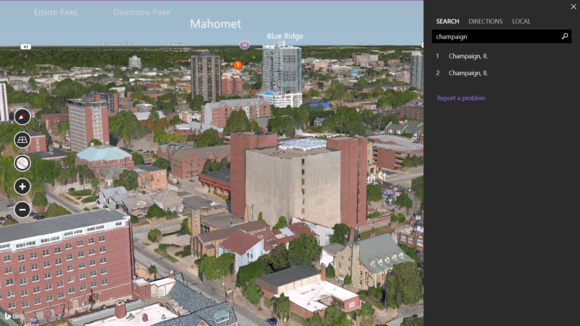 The new Bing Maps Preview also has a “street view” analogue to what Google offers, which can be accessed by swiping up from the bottom of the screen. When you do so, you can also reveal local traffic conditions, which can be saved as a live tile for a quick check, say, before heading home from work. The latter scenario probably justifies the update—although Google Now and other Android-specific services will also flag you with traffic updates to plot your commute, as well.